This graphic shows a gap in a protoplanetary disk around the nearby red dwarf star TW Hydrae. At left is a Hubble Space Telescope image showing a gap about 7.5 billion miles away from the star; the graphic at right shows the gap relative to the star. This story was updated at 5:15 p.m. EDT. Astronomers have found evidence of an alien planet forming surprisingly far from its host star, a discovery that could challenge the prevailing wisdom about how planets take shape. 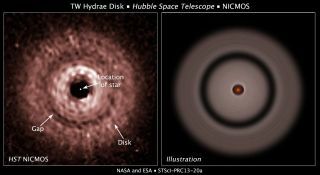 Researchers using NASA's Hubble Space Telescope spotted a large gap in the planet-forming debris disk surrounding the red dwarf star TW Hydrae, which lies about 176 light-years from Earth in the constellation Hydra (The Sea Serpent). This illustration shows that the TW Hydrae protoplanetary disk is much wider than the size of our solar system, sporting a suspected planet 7.5 billion miles from the star. At this distance, the putative planet would orbit far beyond our Kuiper Belt, a reservoir of icy, leftover material from the formation of our solar system. The gap's farflung location poses problems for the leading planet-formation theory, which holds that worlds grow slowly over tens of millions of years by sweeping up gas, dust and rocks from the protoplanetary disk. Planet formation should proceed more slowly at relatively greater distances from the host star, according to this idea, because orbital speeds are reduced and there is less raw material in the outer reaches of the disk. It should thus take the potential TW Hydrae planet more than 200 times longer to form than it took Jupiter, which lies just 500 million miles (800 million km) from the sun, researchers said. Jupiter is thought to have taken shape over the course of 10 million years or so. But the numbers don't add up, because TW Hydrae, which is 55 percent as massive as the sun, is just 8 million years old. An alternative idea posits that planets can form very rapidly — within a few thousand years — when pieces of the protoplanetary disk become gravitationally unstable and collapse on themselves. But even under this scenario, it's unclear how such a low-mass planet could form, researchers said. "If the mass of this suspected planet is as low as it seems to be, this presents a real puzzle," astrophysicist Alan Boss of the Carnegie Institution for Science in Washington, D.C., who was not involved in the study, said in a statement. "Theory would say that it cannot exist!" Further study of the TW Hydrae system may help astronomers figure out what's actually going on. "If we can actually confirm that there's a planet there, we can connect its characteristics to measurements of the gap properties," study lead author John Debes, of the Space Telescope Science Institute in Baltimore, Md., said in a statement. "That might add to planet formation theories as to how you can actually form a planet very far out." Complicating matters further is the observation, made by the Atacama Large Millimeter Array in Chile, that the TW Hydrae system lacks dust grains larger than a grain of sand beyond about 5.5 billion miles (8.9 billion km) from the star. "Typically, you need pebbles before you can have a planet," Debes said. "So, if there is a planet and there is no dust larger than a grain of sand farther out, that would be a huge challenge to traditional planet formation models." Debes and his team used Hubble's Near Infrared Camera and Multi-Object Spectrometer to study TW Hydrae in near-infrared light, then compared these observations to archival Hubble data and optical and spectroscopic observations from the observatory's Space Telescope Imaging Spectrograph. The gap in the disk showed up in every case. Astronomers measured its width at about 1.9 billion miles (3 billion km), which helped them estimate the mass of the potential planet that carved it out. TW Hydrae's entire protoplanetary disk spans about 41 billion miles (66 billion km). The study will appear online Friday (June 14) in The Astrophysical Journal. Editor's note: Due to an error in a NASA statement, a previous version of this story claimed that the potential TW Hydrae planet, if confirmed, would be the most distantly orbiting alien world ever found. This is not the case.